Dauphin County was severely impacted by the 1894 denominational split in the Evangelical Association. Some charges were divided, with some congregations remaining in the Evangelical Association and others siding with the United Evangelicals. Some congregations were divided, with some of the members remaining in the Evangelical Association and others leaving to form competing United Evangelical Congregations. Some congregations did not survive the split and ceased to exist soon after 1894. Not all the congregations that survived the split participated in the 1922 re-union of the Evangelical Association and the United Evangelical Church to form the Evangelical Church (which then joined with the United Brethren Church in 1946 to form the Evangelical United Brethren [EUB] denomination. Many United Evangelical congregations declined to participate in the 1922 re-union, left the denomination, and eventually formed the Evangelical Congregational Church. For the purposes of this list, those congregations are considered "closed" churches ― i.e., they are congregations that were once part of United Methodism, and now are no longer so. In general, Evangelical congregations will be designated either EA or UE according to whether they were part of the Evangelical Association or the United Evangelical Church during the denominational split. The borough of Berrysburg is centered at the intersection of PA 25 (9 miles west of Millersburg) and PA 225 (12 miles north of Halifax). From the center of town, go 0.5 miles south on PA 225. The church is on the right. This congregation of the Evangelical Association worshiped with the Lutheran and Reformed congregations in the Union Salem Church [now Peace United Church of Christ] until erecting their own church building at the present site in 1846. The 1894 denominational split divided the congregation. The majority sided with the United Evangelical Church and re-purchased the church building in 1896. The congregation opted not to participate in the 1922 re-union that formed the Evangelical Church ― joining with Elizabethville, Gratz and Pillow to form the Berrysburg charge in the newly-formed Evangelical Congregational denomination. The building is the home of the Berrysburg Evangelical Congregational Church. The borough of Berrysburg is centered at the intersection of PA 25 (9 miles west of Millersburg) and PA 225 (12 miles north of Halifax). From the center of town, go 0.5 miles west on PA 25. The building is on the left. This 36x41 frame building was erected as a Methodist place of worship is 1843 and used until being closed in 1921. The building was used for many years as the Hoover Funeral Home. It was later joined to the former Hoover's Appliance Store and used as an annex to that business. The building is now unused. There is a Methodist Cemetery west of town. The borough of Berrysburg is centered at the intersection of PA 25 (9 miles west of Millersburg) and PA 225 (12 miles north of Halifax). From the center of town, go 0.5 miles north on PA 225. The building is on the right. The United Brethren work in Berrysburg began in 1872 when the pastor of the Lykens Valley circuit started holding services in a hall. In 1892 William Sweitzer, a member of the class, purchased the hall and presented it to the congregation. The first floor of the building was then transformed into a sanctuary, while various organizations continued to use the upper floor. The church was served as part of the Lykens Valley circuit until 1926. Since that time it has been served in connection with larger church as follows. The appointment was discontinued in 1967. In 1973, the property was sold to the Maranatha Chapel of Berrysburg, Inc.
From S. Front Street in Steelton, turn east onto Highland Street, at the St. Lawrence Lodge. Go east ½ mile to Center Street. Go south 1/3 mile on Center Street to Monroe Street. The building is on the northeast corner of Center and Monroe Streets. New Benton was the original name of Bressler, an unincorporated village between Steelton and Oberlin. This congregation was started as an outreach of Harrisburg Epworth, where some members opened a Sunday School in the schoolhouse and then proceeded by faith to purchase a lot and erect a building, which was dedicated 4/26/1903. The problem was that the area was officially within the bounds of the Philadelphia Conference – which resented the incursion into their territory and refused to recognize or accept the congregation. It was served by supplies, students and retired persons and last appears in the statistics in 1924 with 28 full members and an average Sunday School attendance of 56. That year is was placed with Newville and served by a student from Dickinson College. After that it no longer appears in the journal. The congregation was forced to be unaffiliated, and the building now houses the Bressler Bible Church. From the stoplight, south of Halifax, at the intersection of PA 225 and PA 147, go north 1 block on 225-147 to Powells Valley Road. Go east on Powells Valley Road 9 miles to the community of Carsonville. The church is on the right, just before the main road turns left. One-fourth of an acre of ground was purchase and this church was erected in 1862. Carsonville Trinity (along with Jacobs, Union and Zion “Stone”) was one of 4 churches on the original Powells Valley charge. In 1934 Powells Valley and Enders combined to make the United Brethren’s large rural 8-point Enders Powells Valley charge that existed until the 1968 United Methodist Union. From the borough of Dauphin, go north 2 miles on PA 225 to PA 325. Go east on PA 325 [Clarks Valley Road] 2 miles to where the road crosses Clarks Creek. Just before the road crosses the creek, turn left onto the old road. The building stood on the left, immediately before the old bridge. 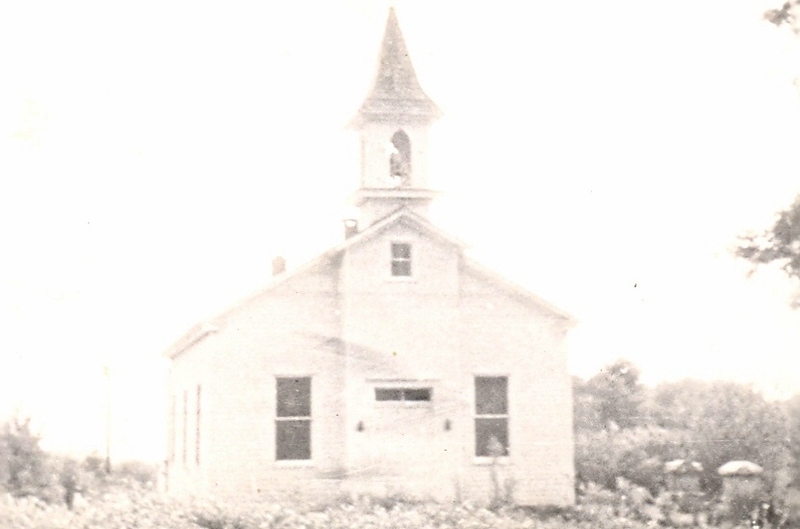 While there were Evangelical services conducted over the years with varying degrees of regularity in the Clarks Valley schoolhouse, this congregation was formed (and the building erected) by the Evangelical Congregational denomination in 1930 and was never part of one of United Methodism’s predecessor bodies. It is included here for completeness – see the account of Zion EV. In 1972 this congregation merged with the relocated Zion congregation to become the Clarks Valley Zion Evangelical Congregational Church on McKelvey Road (the western extension of Clarks Valley Road from PA 225). This building is no longer standing. Cross Roads [aka Washington Square] was situated just east of, and continuous with, Elizabethville. Today it is part of the borough of Elizabethville. Main Street is US 209. The building is on the south side of the road, at 10 East Main Street. The Methodists erected this one story, one room, frame house of worship in 1871. The Methodist congregation lasted only two years. By 1873 the building was being used by a United Brethren congregation of the East German Conference. In 1879 the building was sold to the United Brethren. The United Brethren worshipped here until erecting their new building in 1888. The structure was remodeled into a store and dwelling, occupied for many years by Straub's Clothing Store. From the Harrisburg interchange of I-83 with US 22, go east 1 block on US 22 [Jonestown Road] to Colonial Road. Go north ¾ miles on Colonial Road (just across Devonshire Road). The site is on the right. East Pennsylvania Conference of the Evangelical Association. This church was erected in 1868 on land given by Leonard Crum on what was then known as Goose Valley Road. The majority of the congregation (actually, all but one or two members) sided with the United Evangelical Church in 1894 and left to erect what is now Charlton UMC. The building continued to be used by various church groups until about 1915, but was completely abandoned by 1920. One night in 1933, the building was dismantled and hauled away by unknown persons to an unknown fate. The property is now designated as the Charlton United Methodist Church Cemetery. When approaching Dauphin on the US 22-322 expressway from Harrisburg, take the Dauphin Boro exit (immediately after passing through the railroad underpass) and proceed west 4 blocks to Swatara Street. Go south 1 block on Swatara Street to Juniata Street. Go west 1 block on Juniata Street to Market Street. The church building is on the southeast corner of Juniata and (northbound) Market Streets. This congregation met in a school house before erecting their first building in 1871. The congregation sided with the United Evangelical Church during the 1894-1922 denomination split. In 1922 the United Evangelical pastor who had been serving the appointment participated in the denominational re-union and was reassigned by the Evangelical Church, but the congregation sided with the dissident group that stayed out of the re-union to form the Evangelical Congregational Church – and that group also assigned a pastor to the congregation. Oral tradition states that the two pastoral families shared the parsonage while the dust settled and the congregation eventually officially Evangelical Congregational. The building is now Trinity Evangelical Free Church. When approaching Dauphin on the US 22-322 expressway from Harrisburg, take the Dauphin Boro exit (immediately after passing through the railroad underpass) and proceed west 6 blocks to Church Street. Go north 1 block on Church Street to Erie Street. The church building is on the southwest corner of Church and Erie Streets. The congregation traces its beginnings to about 1835, when a wooden church building was erected on Railroad Street. When that structure burned to the ground on January 12, 1888, the present site was purchased and the existing stone building was erected and dedicated within the year. This appointment was originally on a circuit with Coxestown [St. Mark’s], Paxton and Heckton. For approximately the last 100 years of its existence, until 1993, Dauphin formed a two point charge with Heckton. The congregation gradually dwindled away and the church was closed in 2000. There are 1921 references to a Dayton United Evangelical Church that remained out of the 1922 denominational re-union and became part of the Evangelical Congregational Church, existing and supplied with Muir at least until 1975. Evangelical historian Paul Deiner [see “The Evangelical Church in Dauphin County,” THE CHRONICLE, 1998, pages 54-70] states “The Evangelical Association appointment at Dayton met in a schoolhouse, and there was no church building there until the United Evangelicals erected one following the 1894 split.” Nothing more is known about this congregation or building. From the intersection of Main and Market Streets in Elizabethville (the intersection of US 209 and PA 225), go west 3 blocks on Main Street (US 209) to Buttonwood Street. The building stood on the southeast corner of Main and Buttonwood Streets. This frame building was erected in 1886. The small congregation began to diminish in the 1930’s and following the 1946 Evangelical – United Brethren denominational union, the congregation accepted the invitation to become part of their sister EUB church, Elizabethville Trinity, which had been United Brethren. The building was sold in 1948 to adjacent property owner Edward T. Romberger, who donated the memorial window depicting “The Shepherd and the Lost Sheep” to the merged congregation. Mr. Romberger sold the building to the Emmanuel Wesleyan Church, who dismantled the structure in sections and moved it to the north side of PA 25, about 1 miles west of Gratz. The old building is no longer standing, as that that congregation erected a new sanctuary in 2004 and a new educational wing in 2010. The Elizabethville site is now a grassy lot. Salem (along with Halifax Ebenezer, Fisherville Grace and St. Paul’s) was one of 4 churches on the original Enders charge. In 1934 Enders and Powells Valley combined to make the United Brethren’s large rural 8-point Enders Powells Valley charge that existed until the 1968 United Methodist Union. In 1998 Salem merged into Fisherville Grace, the lone remaining congregation from the original Enders charge. From Halifax to north 3.5 miles on PA 225 to the village of Fisherville. The church is on the left as you enter the village. This building was erected by the Methodist Episcopal denomination in 1859, sold to the United Evangelical denomination in 1891, and sold to the United Brethren denomination in 1903 – after which, by denominational unions, it became Evangelical United Brethren and United Methodist. This building now houses the Fisherville Grace United Methodist Church. From the interchange between Harrisburg and Dauphin of US 22-322 with PA 443, go east 3.5 miles on PA 443 [Fishing Creek Valley Road] 3.5 miles. The church is on the right. East Pennsylvania Conference of the United Evangelical Church. Jacob Albright preached in the Fishing Creek Valley, and records (see THE CHRONICLE, 1998, page 54) credit him with at least conversion here in 1801 and one baptism in 1803. The class here was formally organized in 1831 and the building erected in 1898. This congregation remained out of the 1922 denominational reunion and became part of the Evangelical Congregational denomination, known today as Trinity Evangelical Congregational Church. From the square in Millersburg, go 5 miles east on US 209 to Shiffer Mill Road. Turn right on Shiffer Mill Road and go 0.2 miles. The site is on the left. The first building at this site was erected in 1858. A new building was erected in 1901 and substantially improved in 1935. The congregation was always vibrant, but never large – peaking at about 75 members in the 1950’s. There were 25 members remaining on the rolls when services were discontinued in 1969. The building has been razed and replaced with a marker that contains the church bell. The cemetery remains. Market Street is PA 25. From the center of Gratz, go west 1 block on Market Street to Pine Street. The building is on the southeast corner of Market and Pine Streets. This congregation was United Evangelical during the 1894-1922 denominational split and became part of the Evangelical Congregational Church in 1922. They relocated to a site 1 mile east of Gratz and are now the Good Shepherd EC Church. From Halifax go north 2.5 miles to Ebenezer Road. Go east 0.5 miles on Ebenezer Road. The church is on the left. This building was erected in 1874. Ebenezer (along with Enders Salem, Fisherville Grace and St. Paul’s) was one of 4 churches on the original Enders charge. In 1934 Enders and Powells Valley combined to make the United Brethren’s large rural 8-point Enders Powells Valley charge that existed until the 1968 United Methodist Union. Entering Halifax from Harrisburg on PA 147 (4th Street), proceed straight across Market Street to the T with Armstrong Street. Turn left onto Armstrong Street and go 2.5 blocks. The building is on the right. This building was erected to accommodate Evangelical Association members living in Halifax. It was part of the Millersburg circuit, but according to Egles’ 1883 county history the work had been abandoned. Entering Halifax from Harrisburg on PA 147, follow PA 147 when it turns left onto Market Street. Continue 1 block. The church is on the right on the northwest corner of Market and Third Streets. The building is now the home of the Halifax Area Historical Society. From the intersection of Herr and Cameron Streets, go west ½ block on Herr Street. The site is on the right, believed to be approximately where this eatery now stands. Washington Conference of the Methodist Episcopal Church. The church building that stood on this site was erected by the United Brethren [see Harrisburg Plymouth Chapel UB] in 1873 and sold to the Methodists in 1894 for $750. While the history of black Methodism in Harrisburg is difficult to document, it appears that this is the beginning of what became Mitchell Memorial UMC – the congregation later relocating to Briggs and Cowden Streets, then to 1322 Marion Street in 1938, and to 1919 North Fourth Street in 1957, before merging with Camp Curtin to form the present Camp Curtin Memorial Mitchell UMC in 1989. Regina Street runs parallel to and a few blocks south of Walnut Street. The site is believed to be close to the above pictured southeast corner of Regina and Chayne Streets. This was the first effort of the United Brethren to establish a work in the Allison Hill section of Harrisburg. Land was purchased and a building erected in 1871. The congregation struggled under an embarrassing debt. One report says that the building was sold in 1879 “for debts that could not cancelled” – but that the society remained organized, possibly continuing to meet in the building. The appointment is not listed after 1882 and Egle’s 1883 county history states that “Calvary Church was situated on Regina Street near Fifteenth, but is no longer in existence.” Gibble’s 1951 History of the East Pennsylvania Conference discusses the project, and the exact wording of the deed, on pages 204-5. Derry Street is a main thoroughfare, the original road from Harrisburg east to Hershey. The church is on the southwest corner of Derry and 21st Streets. From I-83, take the 17th Street exit (if heading westbound) or the 19th Street exit (if heading eastbound) and go a few blocks north to Derry Street and then a few blocks east to 21st Street. This congregation began in 1890 when 88 persons met in the East End School House on 21st Street to organize the Epworth Methodist Episcopal Sunday School. A church building was dedicated at 21st and Derry on January 29, 1891, and added to in 1899 and 1902. The original frame building was razed and the present stone structure erected on the same site and dedicated September 3, 1922 – the congregation worshiping during the construction in a temporary tabernacle erected at 20th and Derry Streets. From the Forster Street Bridge across the Susquehanna River into Harrisburg, go east several blocks to 6th Street. Go north on 6th Street almost a mile to Granite Street [one block past Hamilton Street, and just past the Hamilton School on the right] Go west on Granite Street 1 block the 5th Street. The church is on the northeast corner of Granite and 5th Streets. An 1869-70 winter revival at the Ridge Avenue Methodist Episcopal Church resulted in numerous converts, many of whom lived north of Reily Street. Local preacher Robert McWilliams obtained permission to hold services on a plot of ground at 5th and Granite Streets during the summer of 1870. The services were well attended, the land was purchased, and a chapel was erected and dedicated November 16, 1870. In 1889, the present sanctuary was erected and the original chapel was moved to the rear of the lot to be used for Sunday School. 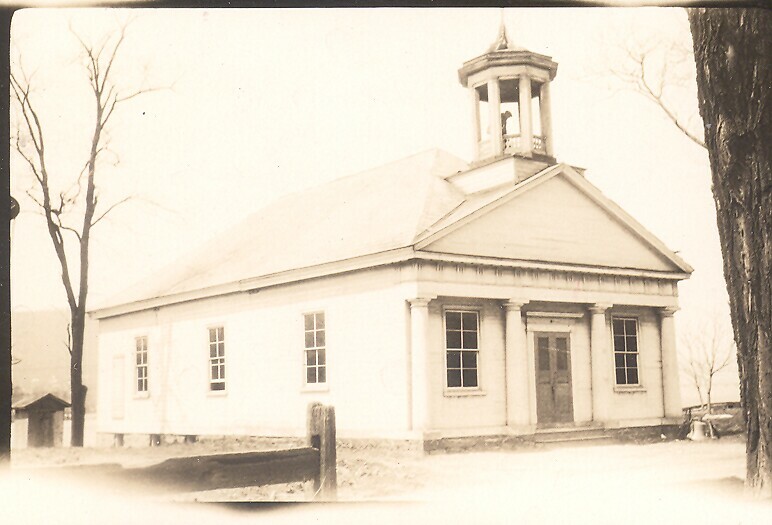 In 1904 the original chapel was removed and a Sunday School annex added to the sanctuary. In 1930 additional land was purchased, the sanctuary and annex were extensively remodeled, and an entirely new Church School unit was added. The building is now home to the Bethel AME congregation. The church building stood on lot #52 of the original town plan – the second lot south of Locust Street. The 40x50 brick church building that stood on the site had been erected by the Baptists in 1831, sold at a sheriff’s sale in 1850 to a Levi Wolfersberger, and sold by Mr. Wolfersberger to the United Brethren in 1851. This was the first United Brethren effort in the city of Harrisburg, and the congregation consistently struggled financially. In 1861 the church house was sold by the sheriff and the appointment was dropped from the Dauphin circuit. The congregation moved to 1322 Marion Street in 1938 and to 1919 N. Fourth Street in 1957. In 1989 the congregation united with the Camp Curtin Memorial congregation to become the Camp Curtin Memorial Mitchell UMC worshiping in the former Camp Curtin building. The Marion Street property that was sold in 1957 is now an empty lot. The Fourth Street building is now (2018) the Rose of Sharon Baptist Church. This congregation was the re-union of the Trinity Chapel (English) and Salem (German) congregations. When the congregation sided with the United Evangelicals in 1894, the building was lost and the congregation erected the Harris Street church. This cornerstone is now on the rear of the educational wing of the Harris Street church. From the intersection of 3rd and Forster Streets, go 11 blocks north on 3rd Street to Peffer Street. The property is on the northeast corner of 3rd and Peffer. The congregation grew out of a Sunday School that began in the summer of 1906 in the old Susquehanna School at Fifth and Seneca Streets. A congregation was formally organized in February 1907 with 40 charter members. The congregation continued to meet in the school building until the present structure was dedicated in March 1913. In 1970 the Sixth Street congregation joined with two former Methodist churches, Trinity and old Paxton, to form the new Paxton United Methodist Church and erect their present structure on North Progress Avenue. The building was sold to the Macedonia Baptist Church. In 2006 the building was given to Harris Street UMC to possible use as a community center, but that didn’t develop and the property was sold to St. Mark’s Coptic Orthodox Church in 2009. That congregation ultimately accepted a better offer out of the flood plain at the former Memorial Lutheran Church at 17th and State Streets and put the property up for sale. The building was flooded again in 2011 and is still (2014) vacant and for sale. The congregation was formed in 1874 by the English-speaking members of Salem EA. The two congregations re-united in 1886 to erect Trinity [aka North Street] EA. This cornerstone is now on the rea of the educational wing of the Harris Street church. Jacobs (along with Carsonville Trinity, Union and Zion “Stone”) was one of 4 churches on the original Powells Valley charge. In 1934 Powells Valley and Enders combined to make the United Brethren’s large rural 8-point Enders Powells Valley charge that existed until the 1968 United Methodist Union. From the square in Lykens, go north 2 blocks on Market Street. The building is on the northeast corner of Market Street and North Second Street. Philadelphia Conference of the Methodist Episcopal Church. This congregation had its start in 1849, when the pastor from Halifax came to hold a funeral service for the victims of a mine fatality. The pastor was then asked to preach there on a regular basis, and a church building was erected in 1851. The original structure was replaced by the existing building in 1868, which was significantly renovated in 1947. On the occasion of the week-long 100th anniversary celebration of the congregation, addresses were given by five bishops and the governor, James Duff, of Pennsylvania. 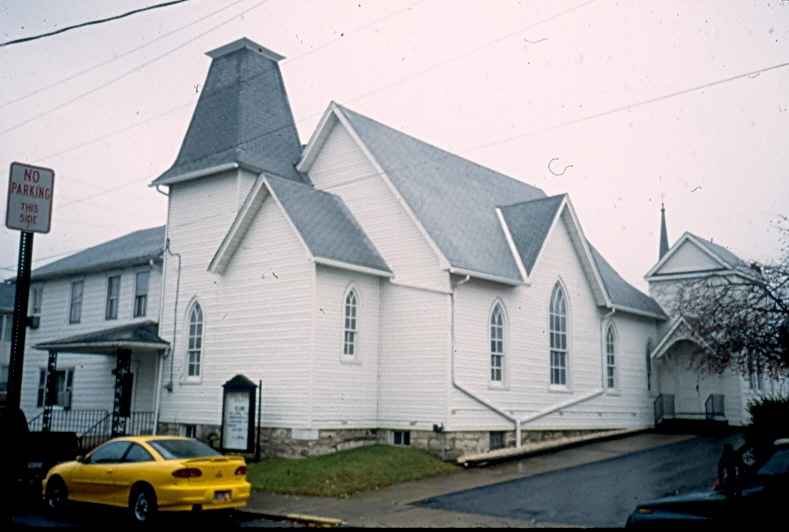 In 1970, the Lykens Grace and UCC congregations merged into the Lykens Otterbein (former United Brethren) congregation to create the present Lykens United Methodist Church. The former UCC building became the town library. From the interchange of I-81 and PA 39, go 100 yards southeast on PA 39 to Jonestown Road. The church stood on the northwest corner of PA39 and Jonestown Road. This congregation grew out of Union Sunday School which met in a mill – about ½ mile east, where the Jonestown road crosses Manada creek. A United Brethren appointment was organized in 1904 and added to Grantville circuit. In 1909 the Pleasant Grove Union Chapel in Fishing Creek Valley was dismantled and moved to the present site. In 1954 the building was moved to a new foundation on the center of the lot, a wing was added on the south, and a basement was placed under the entire structure. Over the years the membership gradually dwindled and a closing service and celebration of ministry was held November 23, 2003. This building was erected by the Evangelical Association after they had initially “given up” in Millersburg and sold their original structure to the United Evangelicals. The congregation did not survive to the 1922 denominational re-union. The property is on US 209, 0.75 miles east of Elizabethville, on the north side of the highway. This is believed to be the site at which the first Methodist building in upper Dauphin County was erected in 1814. Henry Kuntzelman Sr, a German-speaking Methodist local preacher, was the owner of the land. In 1834 he deeded the property to trustees [John Motter Jr, Isaac Motter, Henry Kuntzelman Jr] "legally elected and appointed by the Methodists and United Brethren congregations in union." In 1863 the United Brethren purchased a lot adjoining this property to the west and erected a separate building. Eventually both congregation relocated to the Elizabethville-Cross Roads [aka Washington Square] area, the Methodists in 1871 and the united Brethren in 1873, and preaching was discontinued at the Motter locations. From the town of Loyalton, go west 0.6 miles on US 209 to Rakers Mill Road. Go north 100 yards on Rakers Mill Road. The site is on the right. This frame church was built in 1852, mainly to serve workers of the nearby iron works located along Wiconisco Creek. When the iron works were partially destroyed by a flash flood about 1870, most of the workers moved away and the church never recovered. By 1883 there was no longer regular preaching. From the town of Loyalton, go west 0.6 miles on US 209 to Rakers Mill Road. Go north 1 mile on Rakers Mill Road. The site is on the left. This congregation began as people met for prayer meetings in private homes in the area. The church building was dedicated on Christmas Day, 1859. By 1895, the building was showing its age and the area population was concentrated at Loyalton rather than Oakdale. In 1897 an Evangelical Association church was erected at Loyalton, and Zion became the “weaker sister.” In 1969 the Zion congregation merged into Loyalton. 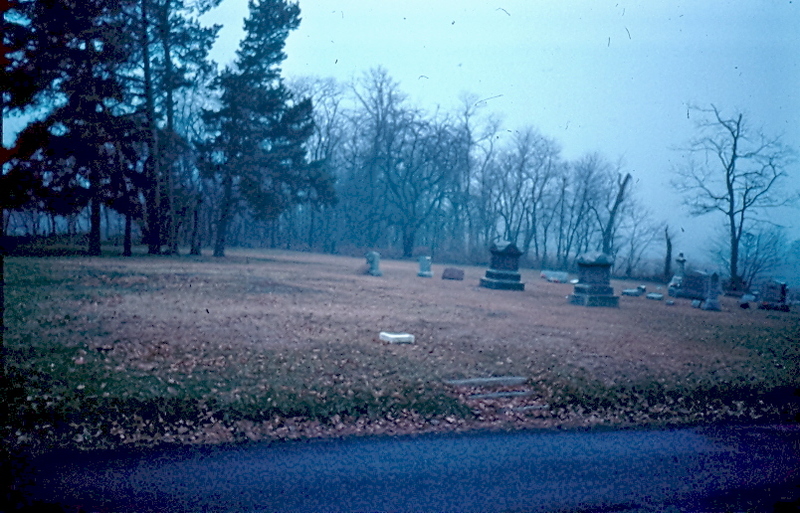 In 1973 the property was sold to the Maple Grove Cemetery Association. From the Harrisburg interchange of I-81 with Progress Avenue, go north 1 mile on Progress Avenue to Paxton Church Road. Go west 1 mile on Paxton Church Road. The building is on the left. This structure was erected in 1860 by local Methodists who organized a society, purchased ground and constructed the building with mostly volunteered materials and labor. In 1970, this rural but fastly becoming suburban congregation received the members of Harrisburg Trinity (former Methodist) and Harrisburg Sixth Street (former United Brethren) and erected a new building on Progress Avenue, just north of Paxton Church Road, which they occupied in 1974. The building now houses and independent congregation. The appointment was discontinued in 1934. The church is on PA 25, 3 miles west of Berrysburg, on the north side of the road. This land was purchased by the United Brethren, for the purpose of erecting a church building, from Benjamin and Catherine Reigle on August 4, 1844. That first structure was razed and replaced by the present larger edifice in 1909. Arthur S. Lehman (1878-1936) and Walter E. Diebler (1895-1976) are ministerial sons of this congregation. The work here began in 1908 when area residents gathered together to form a Sunday School. In 1909 they agreed to become a United Evangelical church. This congregation remained out of the 1922 denominational reunion and became part of the Evangelical Congregational denomination, known today as Trinity Evangelical Congregational Church. St. Paul’s (along with Enders Salem, Halifax Ebenezer and Fisherville Grace) was one of 4 churches on the original Enders charge. In 1934 Enders and Powells Valley combined to make the United Brethren’s large rural 8-point Enders Powells Valley charge that existed until the 1968 United Methodist Union. Union (along with Carsonville Trinity, Jacobs and Zion “Stone”) was one of 4 churches on the original Powells Valley charge. In 1934 Powells Valley and Enders combined to make the United Brethren’s large rural 8-point Enders Powells Valley charge that existed until the 1968 United Methodist Union. This church began in 1850 as a Sunday School meeting in the Red Bridge schoolhouse. An Evangelical Association congregation was formally organized in 1860, and a church building was erected in 1863. The congregation became United Evangelical during the denominational split and remained out of the 1922 reunion to become part of the Evangelical Congregational denomination. The building was damaged beyond repair by hurricane Hazel in 1954 and a new building was erected on McKelvey Road in 1958. In 1972 hurricane Agnes rendered unusable the Clarks Valley EC Church (erected in 1930 on Clarks Valley Road, and never a part of one of United Methodism’s predecessor bodies) and Clarks Valley and Zion united to become the Clarks Valley Zion Evangelical Congregational Church.